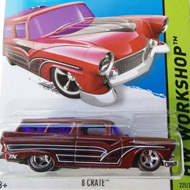 77/250 is part of the HW Off-Road series and the 2015 Super Treasure Hunt set. 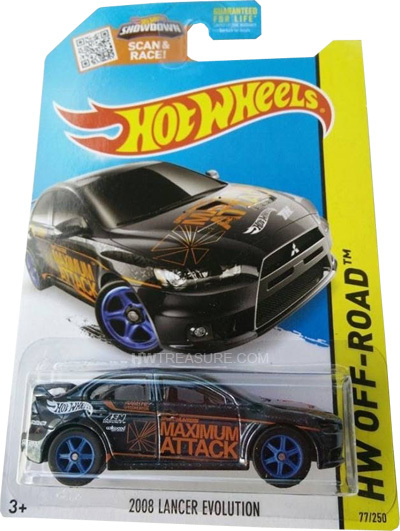 The Spectraflame blue car boasts “Speedhunters Maximum Attack” in orange and the Hot Wheels logo in white on the sides and hood. The hood also has “TH” and there are a variety of orange and white logos and graphics on the sides. 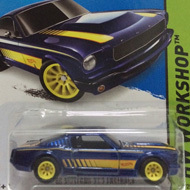 It has tinted windows, a gray interior, blue 6-spoke Real Rider wheels, and a gray plastic Malaysia base. The Lancer made its debut in the 2008 New Models series. It is based upon the car of the same name.